Ozzy Osbourne's ninth studio album as a solo artist (not counting 2005's collection of remakes, "Under Cover") is his first since the massive success of "The Osbournes" reality TV series turned Ozzy into a household name and, to many people, a clown and caricature of his former self. A couple of years after the show has ended, Ozzy has returned with his first all-original outing since 2001's "Down to Earth" and it's a surprisingly crisp and fairly heavy, if none too surprising, affair that could at least partially erase bad memories of the drug-addled buffoon waddling around his house while his wife ran the family business and the kids just ran wild. The album's best numbers are driven by Zakk Wylde's crunching riffs, which are given the right amount of buzzsaw edge by producer Kevin Churko, who manages to keep the guitar's bite in an otherwise futuristic production. 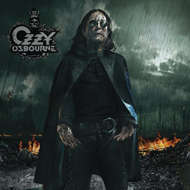 It's actually Churko's touches — creeping electronic swirls here and there, loads of effects on Ozzy's vocals — that give the album a more modern feel than the more forgettable and slick "Ozzmosis" or "Down to Earth" (each of which had some good songs), although it detracts and distracts when he goes overboard with them. But it's Wylde riffs, supported by the thunderous Mike Bordin/Blasko rhythm section, that dominate the proceedings. By going directly into the studio with last year's live band, Ozzy got an immediacy on this record that was also lacking on his last couple of outings. The growling "Not Going Away" kicks things off in pounding style, its moody energy seguing nicely into "I Don't Wanna Stop", a classic Ozzy rocker about his never-ending need to play rock 'n' roll. Both songs wander over lyrical ground that Ozzy has tread many times before, as do the title track, "Countdown's Begun" and "Almighty Dollar", which touch on the world's ills with a bit more specificity (related to current events) than, say, "War Pigs". In other words, politics have crept into Ozzy's latest work as well, although without as pointed an agenda as the new MEGADETH and NINE INCH NAILS records. The album's two ballads, on the other hand, are only half successful. "Lay Your World On Me" is a vaguely sinister-sounding but seemingly heartfelt plea to a friend in need, while "Here For You" is yet another in Ozzy's ongoing series of rather maudlin tributes to his wife and manager Sharon. Whatever you think of the woman, her husband's feelings for her are genuinely touching, and the horror he felt over her cancer scare a while back was palpable, but Ozzy perhaps needs to keep these odes to her off his albums for a while. In the end, "Black Rain" is a pretty focused and compact (10 songs) affair, combining the producer's esthetic with Ozzy's own love of THE BEATLES and psychedelia and layering both over his trademark post-SABBATH heavy rock. If it gets somewhat mundane and even generic on songs like "11 Silver" and "Civilize the Universe", the Oz still generates a solid amount of energy as he approaches his 59th birthday. If he doesn't want to stop, who the hell are we to tell him to?